Kerri Arista: St. Patrick's Day- Don't Pinch Me! There was no green beer for me today. No drunken parade. Instead, it was a great, relaxing day with people I love. I was the only one that actually remembered to even wear green so I had a lot of pinching to do. Don't these people know that green is the hot color for not just today, but for the 2013 year? Yep, that's right- it's been declared Pantone's "Color of the Year"! 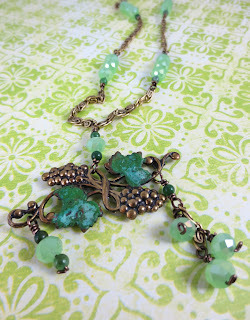 I'm just about to list this repurposed vintage necklace in my ResparkableVintage Etsy shop. Hope you remembered to wear green and didn't receive any pinches... Happy St. Patty's Day!